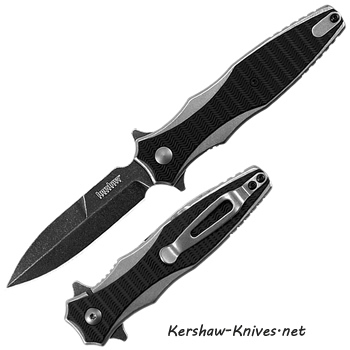 Kershaw Decimus 1559. Decimus means tenth- so Kershaw has taken this to the 10th degree of class and style. This knife is a classic folding knife yet it looks like a dagger- ready for any dual or task. There are dual flippers that not only help you to rapidly deploy the blade but then act as a finger guard when blade is in use. The black wash finish on the 3.25 inch blade looks stylish and helps to hide daily scratches. There is a single-edge bayonet grind on this blade that ends in a sharp tip, ready to stab into your endeauvors. Silver pocket clip is in the tip up position and can be changed from left to right. Black glass filled nylon overlays the silver handle, these help with grip and style. The Decimus is bound to be your next buddy- to the 10th degree.